So the above image is of the Homeless Jesus statue that is outside St Paul's Cathedral here in Buffalo. If you want to know more about the statue read this blog post from last year (it's a pretty interesting history). Anyhow, this is a brief story of what happened tonight. And I'm not sure why I post this stuff but it just needs to come out. I need to share. I had just gotten off a bus I had ridden to the suburbs where I am taking classes at a campus about 10 miles outside the city. I park my bike downtown and take the bus, which drops me off almost at the front door. It was my last meeting with the professor for the semester and I did well. I was also hungry. So while on the bus home I dialed the local hipster taco joint and ordered a couple tacos to pick up on my way home. 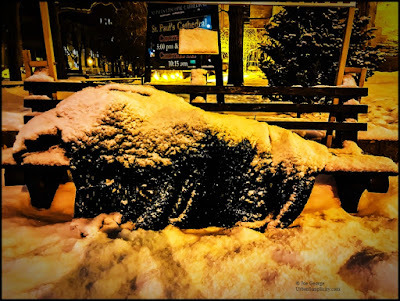 Despite the snowy weather, the bus arrived downtown sooner than I thought and I knew the meal would not be ready so I thought I'd ride by the Homeless Jesus statue to take a photo of it in the snow. When I arrived I saw that someone had draped a quilt over the statue. It really is a striking statue and with the quilt in the snow it looks even more real...like a person sleeping on a park bench in the snow (click here to see better photos of the statue without snow). There was only one other person on the corner when I arrived. I could tell he was cold as he was visibly shivering and stamping his feet. As I squatted down to take a photo I could see he was watching me so I glanced over at him. He asked me if I was taking a picture of the Christmas tree, which is behind the statue. No, I told him, I was taking a photo of the statue. Statue? What statue? He asked. He hadn't seen it under the snow, I guess. He came over and I told him about the statue and its history. He then asked me if I knew what time the bus was coming. Which one, I asked, this is a busy corner. The homeless bus, he told me. Apparently there is a bus that comes by and gives out food and other necessities. I had never seen it but that's what he was waiting for. I have heard of it though, it's from a church on the East Side, it's set up like a food truck. I looked at him and he was shivering. Do you have a place to stay, I asked. Yes, and he told me where. It was on a street in one of our city's most destitute areas. It was a boarding house, he told me. I asked him if it was warm. He told me it was "warm enough," but he had nothing to eat, that's why he was waiting for the homeless bus. And then he walked away to where he was standing before. But he never once asked me for money. I felt like I was in some sort of movie. There I was standing in front of a statue of Jesus as a homeless person, which is in front of one of our city's more beautiful cathedrals, and it is just a couple days before Christmas. Yes, I know it's only a statue, but I actually turned to it and spoke. Are you kidding me, I said. What...is this some sort of a test? Then I stood there for a few minutes, feeling the snow land on my face. And I looked over at James (who declined to have his photo taken). He was still shivering and waiting for his bus. So I walked over and gave him a few bucks. He readily accepted, said thank you, bless you, and Merry Christmas. As I rode away I couldn't help but think of the circumstances in which I found myself this evening. I was worried (about money and time as usual) which takes me out of the moment. And this brief interaction broke open my heart. I was able to see what was real again. And it was just me and James on a street corner in the snow. That's what was real. And this is what happened on this frigid and snowy evening just a couple nights before Christmas and in front of the Homeless Jesus. Now if you'll excuse me I believe I'll go eat my hipster tacos.